At the end of last year/beginning of this year I tried the stunning looking Timeless Beauty Compact Duo, which contains a compact powder and a Divine Lips lipstick. Unfortunately though, for me, the products didn't quite live up to the glamorous looking Art Deco style packaging. The lipstick in the duo did look very promising but the shade I received wasn't for me at all and I didn't even feel comfortable wearing it around the house let alone out in public. So when I received an email regarding just the lipsticks and saw there were some gorgeous looking shades available I wanted to give them a try. I was sent Evelyn* and Suzy Starr* to try. The lipsticks come in exactly the same packaging as the lipstick included within the Compact Duo. The packaging is gorgeous and more than a little similar to the packaging you'll find on Charlotte Tilbury's lipsticks. In fact these are easily mistaken for CT on Instagram. I'm not a huge fan of brands producing packaging that is very similar to that of another brand, but it is beautiful to look at and the band with 'Joan Collins' around the middle does mean the packaging is not pretty much identical. The two shades I received are both very pretty spring/summer appropriate shades. Evelyn is a gorgeous pinky red shade that is just my kind of shade and when I first opened this it reminded me strongly of MACs Impassioned. I was slightly disappointed when I opened Suzy Starr because this is a peachy coral shade, which although very pretty, is not really a shade that tends to suit me. Evelyn is definitely my favourite shade as it really suits me but Suzy Starr is a little too orange based to sit well on me. Both shades are described as cream and apply as such. Both are soft and creamy and easy to apply and can be applied in one swipe. They're both really comfortable to wear and I tend to forget that I'm wearing them as they're far from drying. They don't have a matte finish but also don't have a glossy finish either, they're a nice medium ground between the two. I was pleasantly surprised by how long these can last considering they aren't mattes. They can survive some eating and drinking and can stay pretty much intact for I would say around four or five hours. They would definitely need topping up after this time, which is very easy to do, but come the end of the day when I'm removing my make-up there are still traces of the shade left on my lips, which in the case of Evelyn does require some removal. Although Suzy Starr isn't for me these are both beautiful lipsticks and although £18 is a little expensive (what price is MAC up to now? Last time I looked it was £15,50?) I think they are worth the money. You can find Timeless Beauty on the dedicated website and also in M&S. 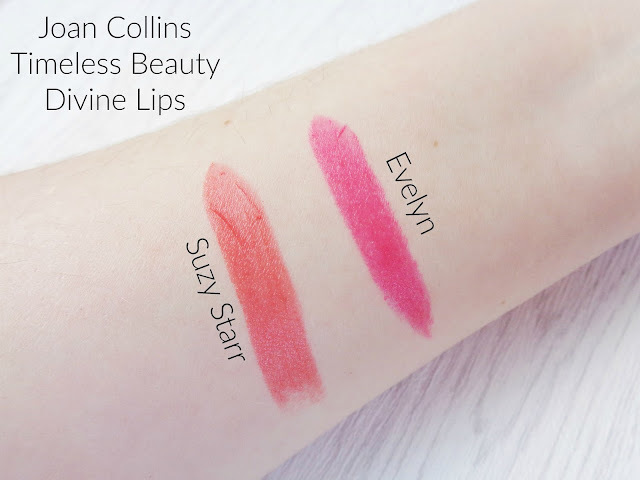 Have you tried a lipstick from Timeless Beauty?